And the show certainly went on. 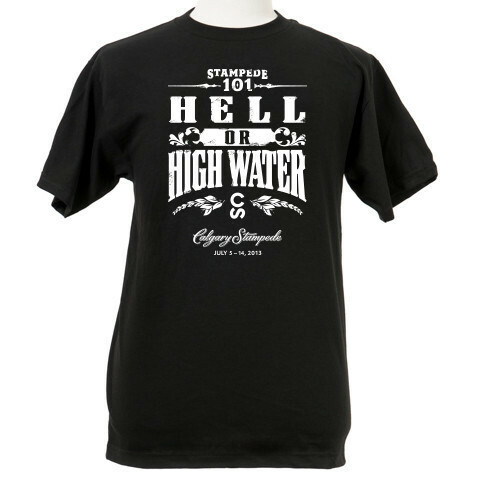 More than $2 million was raised for flood relief from the sale of the popular Calgary Stampede Hell or High Water t-shirts. The 10-day Calgary Stampede wrapped up on Sunday after kicking off, as planned, on July 5. Only two weeks earlier, much of Stampede Park located near downtown Calgary, was under water due to the flooding that hit Calgary and southern Alberta in late June. This shows you what can be accomplished with hard work and determination. Where there’s a will, there’s a way. I don’t think most people realize how much work was required to get the grounds ready in time. Many people worked round the clock – first contractors and then staff and volunteers. In the meantime, Stampede volunteers were volunteering at other locations around the city such as evacuation centres to help with the devastating effects of the flood. Check out this video of the transformation of Stampede Park – Our Second Century Begins. Here’s a video dedicated to the amazing Stampede volunteers. Once again, I had the privilege of volunteering for three days with the Agriculture Media committee. This is a great group of people and I always enjoy it. Some people questioned whether the Stampede should go ahead as planned. I believe going ahead was the right decision even though it required much hard work and effort. It boosted the morale of a devastated city. It showed that our community spirit cannot be washed away. I was proud to have been a part of the flood recovery efforts in southern Alberta. Keep an eye on this blog for great photos from Stampede101! Neither of the videos will work for me. I would like to watch them. Can you try to send them again? I follow your blogs with interest, Teresa. Thanks. Hi Marge. Thanks for reading. I just checked the blog from another computer and all the videos are working for me. The first two videos can be found on YouTube if you want to search for them directly on the YouTube website. The third video is a link so you can try copying and pasting that link into your web browser. Hope that helps.